Definition at line 25 of file CompositePoolNode.h. Definition at line 27 of file CompositePoolNode.h. Definition at line 31 of file CompositePoolNode.h. References delayRead(), dump(), id(), parse(), stats(), and update(). Definition at line 80 of file DelayPool.cc. 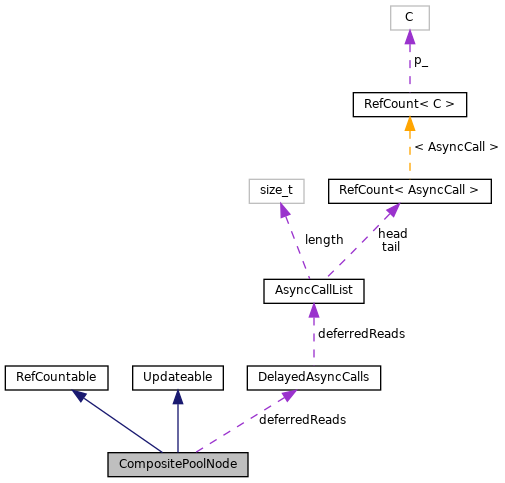 Referenced by DelayVector::Id::delayRead(), DelayTagged::Id::delayRead(), Aggregate::AggregateId::delayRead(), and ~CompositePoolNode(). Implemented in ClassCHostPool, VectorPool, Aggregate, DelayTagged, DelayUser, and DelayVector. Referenced by DelayPool::dump(), and ~CompositePoolNode(). Definition at line 88 of file DelayPool.cc. Referenced by DelayVector::Id::bytesIn(), Aggregate::AggregateId::bytesIn(), DelayVector::update(), DelayTagged::update(), and Aggregate::update(). Referenced by DelayPool::parse(), and ~CompositePoolNode(). Referenced by DelayPools::Stats(), and ~CompositePoolNode(). Definition at line 58 of file CompositePoolNode.h.